It's the perfect chopping board for cutting up your veggies. They make a great cheese board or bread board. Show off your Buckeye pride! Our Ohio State cutting boards are also perfect to use as serving trays for that "big game" or tailgate party! 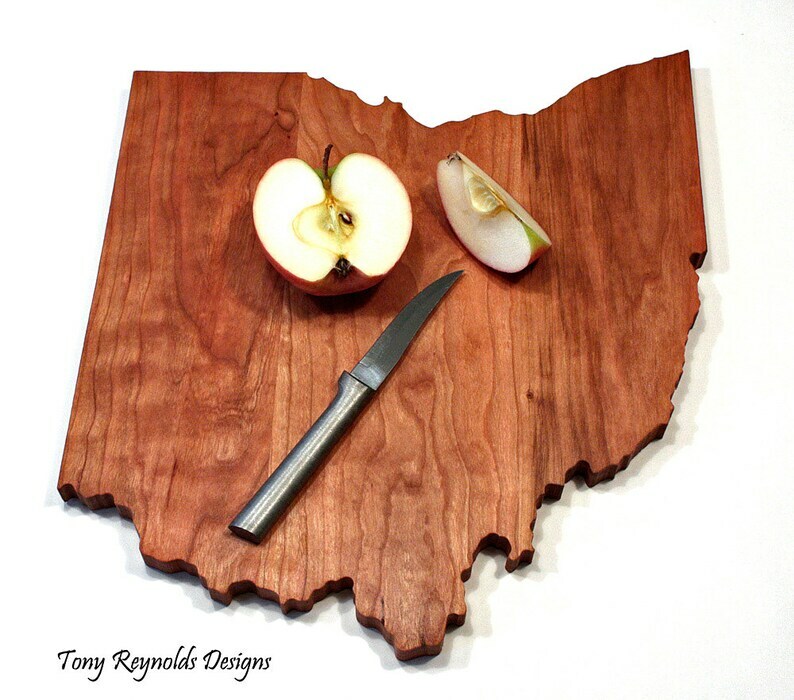 Our State of Ohio cutting board is handmade, heirloom quality and made from beautiful solid Cherry hardwood. It measures approximately 13″ by 13″ and is 3/4″ thick. The finish is 100% FDA approved as food safe. To order select the options you wish from the drop down lists. Proceed to checkout. If you selected to have it engraved leave us that info in the “Notes to Seller” section. If you selected a Heart or Star tell us the city location to place it. If you are shipping this as a gift directly to the recipient and want us to include a short note, please include this information as well. Fill out the proper ship to address and finish paying for your order and we’ll take it from here. In 7 to 10 days you’ll receive an email stating you order has shipped via USPS Priority Mail with a tracking number.